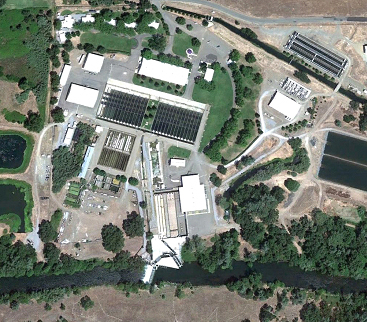 The Coleman National Fish Hatchery (CNFH) is unique among salmon hatcheries in California in that it is not located immediately downstream from the reservoir and dam for which it is intended to mitigate. The hatchery is located in Battle Creek, a tributary to the Sacramento River. Fish produced at the hatchery serve an important mitigation function by partially compensating for salmon and steelhead fisheries that have been impacted by lost natural production resulting from construction of Shasta and Keswick dams, while also contributing substantially to regional economies. Restoration of the Battle Creek watershed upstream of the CNFH focuses on providing fish access to historical habitat and the necessary instream flows to benefit naturally occurring salmonid populations. Construction of the Battle Creek Salmon and Steelhead Restoration Project (BCRP) began in early 2010. The BCRP will restore 48 miles of stream habitat while maintaining hydropower production at the Battle Creek Hydroelectric Project, owned and operated by Pacific Gas and Electric Company (PG&E). The Coleman Adaptive Management Plan (CNFH-AMP) provides a structure to support future operations of the CNFH in a watershed that is experiencing substantial restoration. Adaptive management is an approach for assessing issues and making decisions when varying solutions exist, and where management actions cannot be delayed until the issues and solutions are fully understood. Adaptive management requires an iterative process that incorporates the collection and analysis of data and information as a means of improving understanding, framing new choices, and making decisions. Adaptive management is often considered for use in ecological systems where complex interactions exist that are not fully understood, and there is uncertainty about the best way to proceed. Once completed, the BCRP will be adaptively managed in an adaptive management plan specific to that project (BCRP-AMP). The CNFH-AMP, together with the BCRP-AMP, provides a coordinated framework to guide the long-term management of Battle Creek and the CNFH. The overall aim of the CNFH-AMP is to maximize compatibility of the two plans, to contribute to the mutual benefit of ecological functions in Battle Creek and the fishery benefits resulting from the operation of the CNFH. To better coordinate the two different efforts, a Memorandum of Understanding (MOU) between the Bureau of Reclamation, U.S. Fish and Wildlife Service, NOAA’s National Marine Fisheries Service, California Department of Fish and Wildlife, and PG&E was developed to describe a process of integrated adaptive management of the CNFH and the BCRP. The CNFH-AMP is the culmination of the efforts of a wide range of stakeholders representing the public, federal and state resource agencies, commercial and recreational fishing interests, Battle Creek restoration advocates, and local elected officials. More than 40 meetings were held engaging these stakeholders since 2012. A Technical Advisory Committee met regularly to provide essential data and technical review. Bi-monthly progress updates of the CNFH-AMP effort were provided to the Greater Battle Creek Watershed Working Group. Public comments were sought during the initial public scoping meeting and at the release of the public draft CNFH-AMP. An independent scientific review of the CNFH-AMP also occurred. The public and science panel comments helped guide the development of the document. At this time the documents on this web page are not accessible or VI compliant. If you need accommodations, please contact Mary Marshall at 916-978-5248.